Naturalscapes takes great pride in all of our landscape projects both small and large. We particularly enjoy the challenge of adding water features to landscapes. We have great knowledge in the design and creation of water features that have given our customers great pride in the finished waterscape. Creating a serene environment with the use of water can be extremely pleasant and restful. Your enjoyment of the feature will exceed your expectations. The sound of the water, the unique varieties of pond botanicals and the addition of fish is a breathtaking experience. A unique water feature in which we specialize is a pondless waterfall design. The sound and beauty are truly amazing plus intriguing to see and hear. 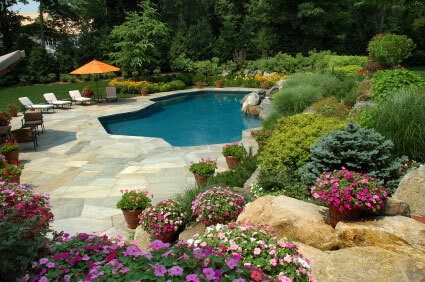 With our experience in waterscape design it makes it easy for our customers to maintain their serene water garden. Just imagine sitting in your backyard relaxing to the sound and sight of your own waterscape.